China slammed a kill vehicle into one of its dead meteorological satellites in 2007. WASHINGTON — Experts have warned for some time that wars in space are not just Hollywood fiction. And the scenario appears increasingly more likely, according to the latest analysis by the U.S. intelligence community. "We assess that, if a future conflict were to occur involving Russia or China, either country would justify attacks against U.S. and allied satellites as necessary to offset any perceived U.S. military advantage derived from military, civil or commercial space systems," warns the 2018 Worldwide Threat Assessment of the U.S. Intelligence Community, released this week by the Office of the Director of National Intelligence. Both Russia and China continue to pursue anti-satellite weapons knowing that, if successfully employed, could undermine U.S. military capabilities, analysts noted. "Russia and China aim to have nondestructive and destructive counter-space weapons available for use during a potential future conflict." U.S. intelligence predicts that "destructive" Russian and Chinese anti-satellite weapons probably will reach "initial operational capability in the next few years." China's military is setting up specialized units and has begun "initial operational training with counter-space capabilities that it has been developing, such as ground-launched anti-satellite missiles." The intelligence community believes Russia probably has a similar class of weapons in development. Both countries also are advancing directed-energy weapons that could make satellites useless by blinding sensitive optical sensors such as those used for remote sensing or missile defense. Another concern is Russia and China launching "experimental" satellites for on-orbit activities that are not necessarily hostile but could help them advance their counter-space capabilities, the report said. "Some technologies with peaceful applications — such as satellite inspection, refueling and repair — can also be used against adversary spacecraft." The report criticized both Russia and China for "continuing their pursuit of space warfare capabilities while publicly maintaining that space must be a peaceful domain." Independent analysts historically have been a bit more skeptical of these intelligence reports, but the latest DNI assessment appears to provide stronger evidence that threats to U.S. satellites are real. Brian Weeden, director of program planning at the Secure World Foundation, has been researching China's space weapons for years. Its arsenal includes ground-based direct ascent missiles that can physically destroy a satellite, jammers that can interfere, and lasers that can be used to dazzle or perhaps even blind imaging satellites, he told SpaceNews. China has conducted a series of tests of on-orbit proximity and rendezvous operations, Weeden said, although the publicly available evidence "does not indicate they are explicitly aimed at offensive capabilities." Russia had several operational anti-satellite systems right up until the end of the Cold War, he noted, and there is "strong evidence to suggest they too are active again." There are indications that Russia is developing its own ground-based direct ascent system known as Nudol, and also resurrected an airborne laser dazzler system known as the A-60, he said. There are multiple reports of Russia using GPS jammers in Eastern Ukraine, and Russia has also done a series of its own on-orbit proximity and rendezvous operations demonstrations, both in low-Earth and geosynchronous orbits. "What's driving this is the desire to blunt the ability of the United States to use space in a future conflict," said Weeden. If a war broke out in the Baltic region or in East Asia, the United States would be heavily reliant on its space capabilities. "They think that by developing these systems they can deter the U.S., and if that doesn't work then they hope to take out enough U.S. space capabilities to win the war." The United States also bears some responsibility for turning space into a battlefront, said Weeden. 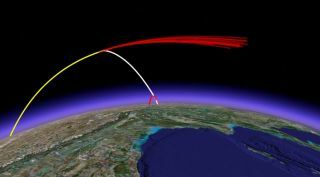 "While the U.S. only has one publicly acknowledged anti-satellite system, the counter communications satellite system, it has a lot of latent capabilities, particularly through its ground-based missile defense interceptors." The United States is probably the world leader in on-orbit proximity and rendezvous operations, he said, and there have been a lot of rumors about the U.S. considering developing more offensive capabilities to "defend" its satellites or take out Russian and Chinese satellites. What is worrisome, said Weeden, is that all parties have strong incentives to go after the other side's space capabilities early in a conflict. "That could lead to some very unstable crisis dynamics and an outcome — armed conflict — that everyone says they want to avoid."